Soybeans. Incorporated in our daily lives from snacks, cooking oils, soap, milk replacer, paints, waterproof cement to cosmetics, soybeans are a vital part in our lives. I love learning about soybeans and how the plant grows, how to increase yield, and how the plant can be affected by disease. Phytophthora root and stem rot is one of the most destructive diseases in Ohio. This disease is an oomycete and survives in the soil, plant debris as oospores and sometimes mycelia. This root and stem rot can infect the soybean plant at any growth stage, but predominantly infects the plant early in the growing season. It will attack the roots first and can infect leaves when infected soil particles are splashed or blown onto the leaves in a storm. How do you know if you have this disease in your field? The disease characteristics are visible during the stem rot phase, where the plant has brown discoloration on the low stem and branches. The entire root system will appear rotten and the taproot will be dark brown. The plant won’t lose its leaves but will be chlorotic at first then turn necrotic. What can you do? Start with knowing your fields and the soil condition. Wet soils are a prime location for phytophthora to reside in. Ask you seed company for resistant cultivars. Planting resistant plants for diseased fields will improve your farms production. There are different physiological races of the disease, so diversifying your seed will help with finding which race is in your field. Seed treatments and fungicides are also practical methods to preventing yield loss. Opposition to Innovation: Does it Hinder or Help? Why do many seem so hesitant about new technologies that could improve our quality of life? Vietmeyer’s examples within Our Daily Bread show how apprehensive Norman Borlaug’s relatives were towards technologies like electricity, automobiles, and productivity increasing seed prove that this reluctance to embrace innovation is not unique to our time. However, I doubt many of us could imagine a life without electricity or a vast selection of food, so why does this reluctance continue? Genetically Modified Organisms (GMOs) provide a possible solution to the problem of feeding a growing population, yet many are opposed to their use. This distrust of GMOs and their supporters has led anti-GMO groups to target researchers in this field. In fact, people have chosen to uproot GMO crops, burn GMO research facilities, and issue death threats against supporters. There is no denying that extensive studies into the effects of any new technology should be conducted before the public is exposed. Yet, testing has done little to lessen anti-GMO groups. Many of the arguments against GM food ignore the vast possibilities they make feasible. With proper modification, pesticides can be removed from crop production. Higher yields mean more food for the more than 7 billion residents of this planet, many of whom cannot afford or acquire proper nutrition. Religious and ethical objections to GMOs are understandable and shouldn’t be abandoned simply to support GMOs, but what is important to remember is that one can choose to not eat foods that possibly contain GMOs and this choice that should be exercised if you are against GMOs. For those that desperately need more food that is affordable, GMOs provide a solution. Those against GMOs should consider those who so desperately need food when deciding what to do next about GMO research and its use. Actually, you can, and honeybees may even prefer it! Urban beekeeping has become quite the trend. As a part of the Green movement, beekeeping for environmental and personal health has caught the attention of many. Hive boxes of various sizes are set up for colonies in backyards all around urban and suburban areas. 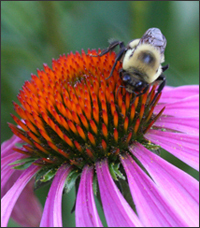 The many flowers in surrounding neighborhoods provide excellent food sources for the bees to forage. Some municipalities and townships may not allow beekeeping. Those not able to keep bees in their area can support bee populations by planting flowers that produce an abundant amount of nectar and pollen. Honeybees can forage miles away from their hives, and store found pollen and nectar to make the honey they feed on. What types of flowers would those be, you ask? A quick Google search will give you an infinite number of lists of plants to choose from. After planting, keeping chemicals harmful to bees away from your lawn is essential; after all, the goal is to welcome the bees, not shoo them away. In return, the bees will pollinate your flowers, and provide honey. Honeybees are vital to the environment and to us; every attempt at saving them is more helpful than we realize. If keeping colonies is something that interests you, beekeeping associations and many other programs offer basic beekeeping workshops to help beginners start their colonies. Yes, I thought. Cold is painful. It’s awful. Some people always seem to “feel” cold. Now, here’s some information on the underlying genetic basis. This research has important medical applications, too, for patients suffering from chronic pain, certain diseases, or side-effects from chemotherapy or other treatments. The wind chill is 8ºF right now, and wrapped in a blanket as I write this. But I’m not complaining. Maybe resiliency is part of my genetics! The spring semester is in full swing, and in our Societal Issues class we’re starting to dig deeper into class topics such as genetic engineering. A recent PEW report reveals that there are wide gaps in opinion between the general public and scientists on several topics. That’s not surprising. What I found most surprising is that the largest opinion difference centers on genetically modified foods. Only 37% of the general public in the survey agreed that genetically modified foods are safe to eat, compared with 88% of the scientist members of the American Association of the Academy of Sciences (AAAS). Why such a wide gap in opinion? Is it an association between genetically modified foods and corporations such as Monsanto? Is it the ominous moniker, “genetically modified food?” Should plant scientists provide more education on the topic? I also found it interesting that there was general agreement among the public and scientists that “the space station has been a good investment for the U.S. – a difference of only 4%. I’m glad that space exploration is still held in high regard among the general public. In the case of genetically modified foods – is it too late to change public opinion?